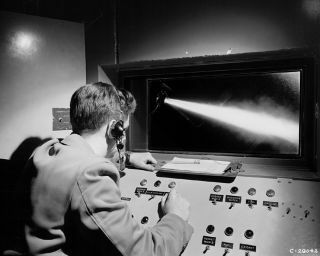 A NACA engineer studies film-cooling of combustors at the Rocket Laboratory. In this historic photo from the U.S. space agency, an engineer operates a rig used for studying film-cooling of combustors. In this method of cooling, a film of relatively cool air is maintained between the hot gases and the combustor wall to serve as an insulator for the wall. The operator is separated from the combustion equipment by 2 feet of reinforced concrete with a steel inner lining. He sees the equipment indirectly, through a periscopic arrangement of mirrors and a window of bullet-proof glass at Lewis Flight Propulsion Laboratory, National Advisory Committee for Aeronautics, now known as John H. Glenn Research Center at Lewis Field, Cleveland, Ohio.